Posted on June 26, 2018 by Kelly M.
Father Time did not pass by Drumlin Farm’s Sensory Tree exhibit. The tree started its life as a beautiful cedar growing adjacent to the admissions window with a bowed trunk uniquely suited to climbing and swinging. After being enjoyed for decades by climbing children, it was removed in 2008 to make way for Drumlin Farm’s accessible path, but was re-purposed as an educational exhibit. The cedar, reborn as the Sensory Tree and designed by Sanctuary Director Renata Pomponi, was coated with resin and augmented with features to engage the senses: smell the cedar, listen to bird calls and woodpecker taps, and search for the hidden animals and insects. For ten years the Sensory Tree provided a hands-on experience for children, teaching them what lives in and around a tree. 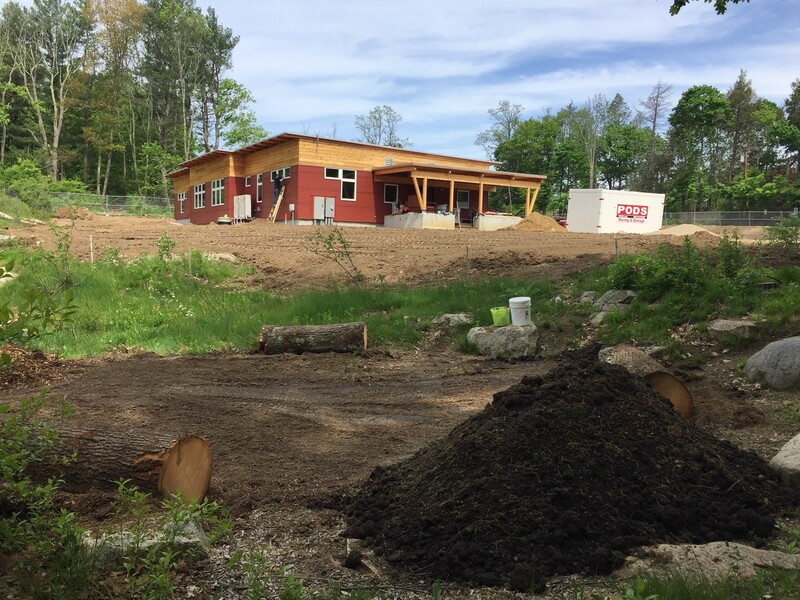 But when it became apparent earlier in 2018 that the Sensory Tree had followed its natural path of decomposition, we needed to think of a replacement activity for this busy location adjacent to the farmyard entry path and our new Environmental Learning Center. Located at an opportune stopping point halfway down the welcome hill, the site would need to provide a destination for children on their way up or down the hill to run to, explore, or take a break at, all while being aesthetically pleasing and adhering to a limited budget. Thanks to an amazing team-effort from Drumlin Farm staff and volunteers, we were able to do just that. Interpretation Educator Norah Mazar designed the area and coordinated the project. Her initial visit provided area dimensions and an appraisal of the site – flat in the center, sloped to the back, partially surrounded by boulders and ledge, a section of partial shade, and an area of full sun. Norah drew-up plans for a nature play area with a spiral stepping activity made from downed trees on site. Nature play areas give people opportunities to connect with nature by encouraging self-directed, unstructured exploration and this winter’s storms knocked over more than thirty trees on the sanctuary, most of them pine, but some hardwoods as well. Naturalist Tia Piney advised on suitable plants for the adjacent slope, with native ferns, perennials and ground covers. The site of the future nature play area. 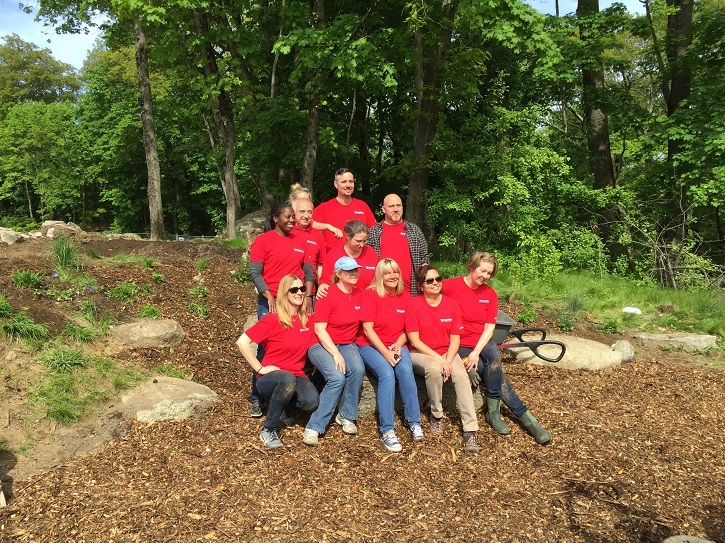 Volunteer Coordinator Pam Sowizral worked with Thermo Fisher Scientific who generously supplied both volunteers to implement the project and funding to offset the costs of top soil, mulch, and plants. Meanwhile Property Manager Geoff Nelson and his staff started preparing for the project day by selecting fallen trees to use and removing the worn Sensory Tree. Project Day was a sunny Friday – May 18. 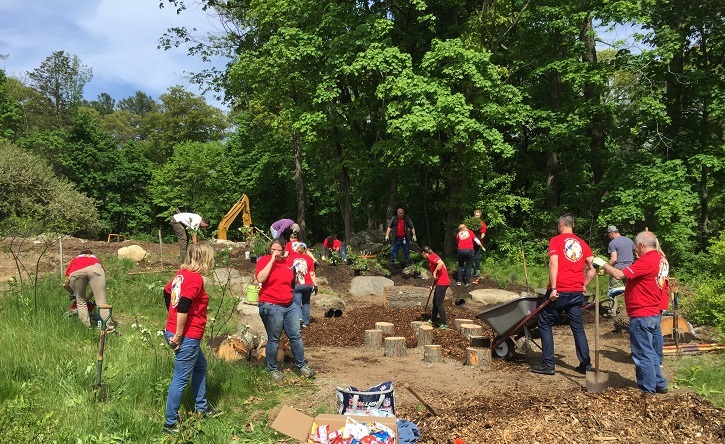 The stumps and logs were eagerly waiting in a pile, as the eighteen Thermo Fisher Scientific employees volunteers came, sleeves rolled up, ready to get to work. Thanks so much Thermo Fisher Scientific Volunteers! Thanks so much Thermo Fisher Scientific Volunteers! Development Director Polly Reeve and uber volunteer Susan Vecchi, provided instruction on proper planting techniques while the team worked together digging, moving heavy logs, and planting. Once the top soil was moved to provide a bed for the new plantings the volunteers were able to get creative in their crafting a unique garden and nature display. Tia had chosen an array of plants native to New England that would be hardy during winters, good growers, and beautiful as well. Some plants were chosen for both foliage and flowers—sweet woodruff, geranium, lupine, trumpet honeysuckle, asters and foamflower. Others, for foliage alone, which can still grab ones eye—prairie dropseed, pink hair grass, feather reed grass, Pennsylvania sedge, Christmas fern, and lady fern. Voila! A perfect spot to stop for a snack, a break, or more play! It is always amazing what a group of hard working folks can accomplish in such a short time. Standing back, at the end of the afternoon, staff and volunteers could admire the finished project—stepping spiral, new seating, and plantings all in place—and feel good about a job well done. What’s more, they can think about the special moments and fond memories that are soon to be made in this area. What neat insects will an curious camper find when stopped here for a snack? Perhaps this will be the spot a young birder is sitting at when they identify their first songbird. Or a new parent may finally enjoy the time off their feet to sit and take in the natural surroundings after exploring the farm loop. 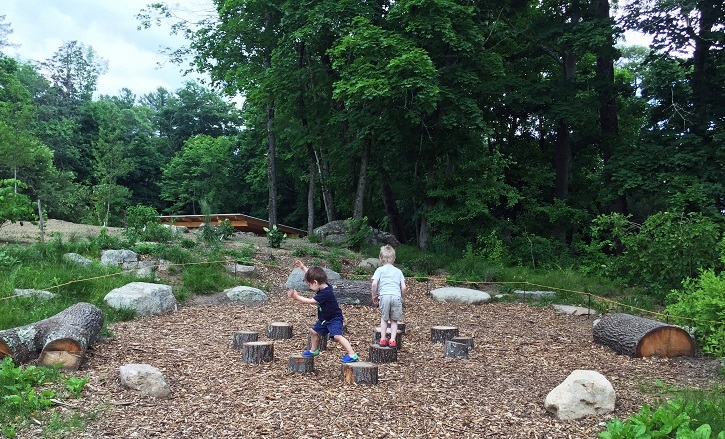 Recently, Norah walked by the completed project and saw two youngsters joyfully playing the classic childhood game “The Floor is Lava” on the stumps as they bounded from one step to the next! 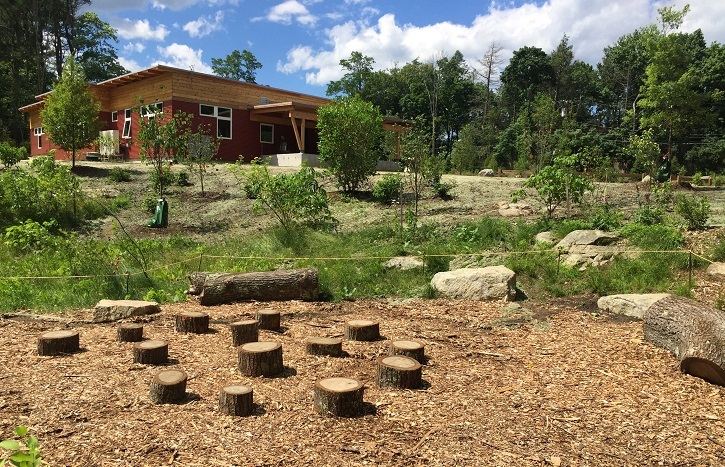 With teamwork, creative re-use of natural materials, and a vision for what can be, a new nature play area for memory making and nature appreciation has found its home. This entry was posted in News and tagged nature play area, volunteer, volunteers on June 26, 2018 by Kelly M..
What a lovely project – totally in the spirit of Mass Audubon to re-purpose and enhance what would otherwise have been wasted.